A first in a few respects for me...lace work and beading....who knew there was a 0.6mm crochet hook? I bought my hand-dyed yarn on Etsy from Perran Yarns and I can't recommend Steph's yarn enough, it is beautiful, reasonably priced and is soooo luxurious. The pattern, even for a beginner at something as fine as this, was easy to follow and any swear words that occurred were purely down to my rubbish-ness! I was undecided as to whether I was going to use the beads, but I was glad I did, as I found them useful as a marker for where I was in the pattern. In the beginning, I found I lost my place in the pattern repeat and couldn't 'read' the stitches quickly enough, but as I got into the swing of things, I soon got into a rhythm, and I even did some knitting and beading at the beach while watching three boys swimming and sandcastle building.....get me! 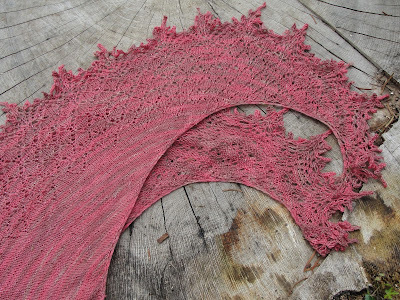 The shawl is perfect, blocking was my saving grace and it is a good size, although not so big as others (maybe I started out on too smaller needle?) the mistakes which I'm sure I did, are not visible ....so I'll just keep quiet about them. Thing is now....I am on a roll....I think I will be casting on another in the next day or so. In four days (whhoooppppeeeee!) we are off on our first 'abroad' holiday to Austria and I'm thinking another Boo Knits shawl would be a nice small project to take for the evenings. Anyone who has any ideas how to stop three boys slapping each other in a 16 hour car-journey, don't hold back, I'm all ears! Anyway....if you would like to catch up with any fellow Knit-a-long-ers hop on over to Sarah's blog Crafts from the Cwtch with this week's link-up being hosted by the pattern designer herself....Mrs. Boo Knits. Well...Quite Continental is quite gorgeous!! 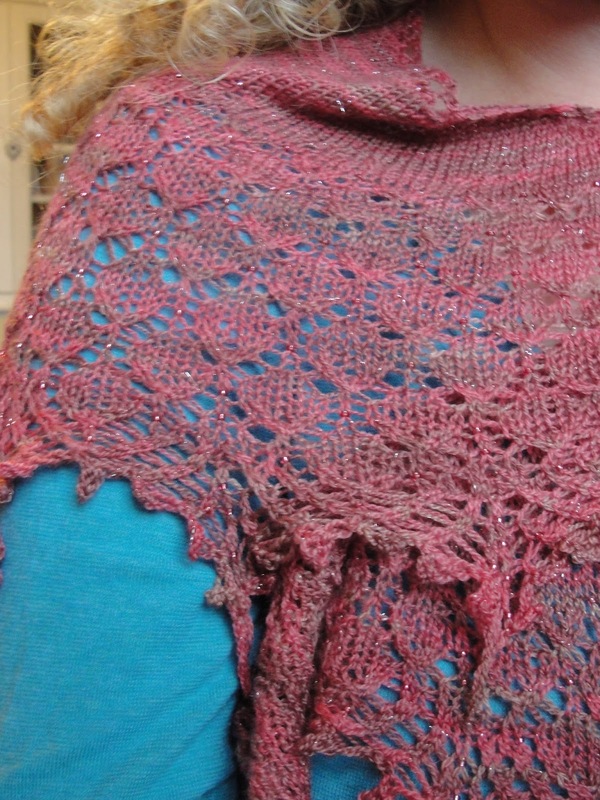 I love it and might cast one on too for my second one...I sure like all her patterns and have more yarn to use! Have a fantastic vacation--lucky you...Austria! Your trip sounds exciting. Totally LOL'd at the image of three boys smacking each other in the backseat. What about "I Spy…"? You can have a checklist or tally mark sheet for things they can look for while on the road. Have prizes or something. A portable DVD player or magnetic games? Your shawl is so lovely! Hooray for getting that done. 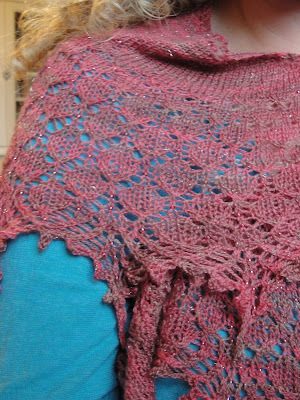 Faith, the shawl is absolutely spectacular. 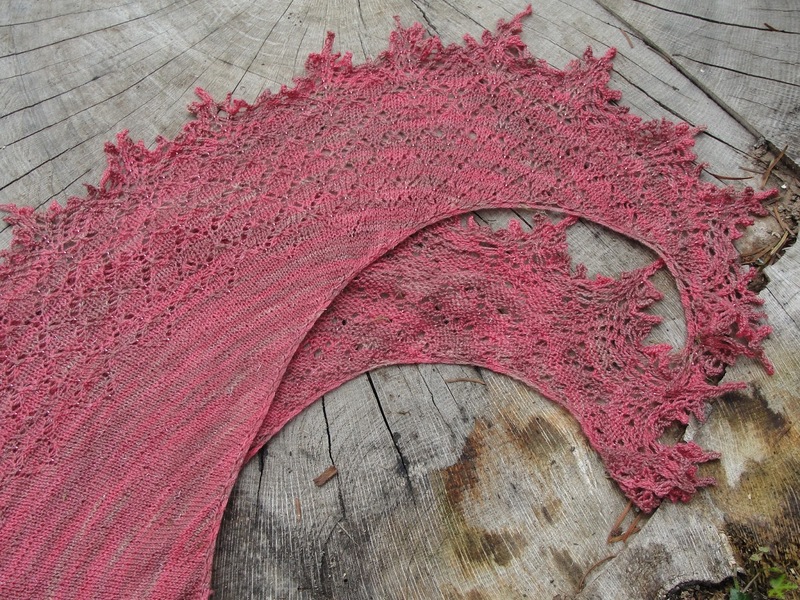 I can't count to 4 on a regular basis so seeing your beautiful lace is an inspiration. Have a lovely time on your trip, it sounds fantastic. It looks absolutely fabulous Faith, truly, well done on such a masterly result, hard to believe there were 'firsts' involved at all! Wow! 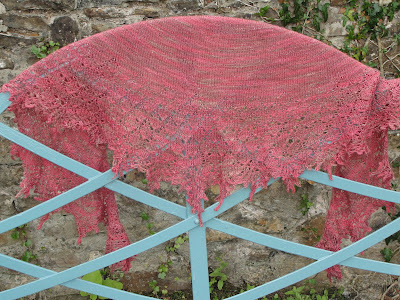 Your shawl is just divine! I love the Boo shawls. You have done a fabulous job! Faith it's just gorgeous, you should be so proud because it is amazing and just out of this world. Enjoy your holiday it sounds amazing and at this stage I'm sure you've left so I hope you get there ok and the boys haven't killed each other lol. Absolutely beautiful Faith (as I knew it would be!) and I love the addition of the beads too...Hope you have a fab holiday with your lovely boys in Austria! That is absolutely beautiful and I bet it goes perfectly with your colouring. Well done, I am full of awe! As for the boys in the car, well I have girls (as you know) but they each have their own dvd player for the car, I know it's a cop out! Perhaps a bribe is in order, points for the best behaved and they get to choose the first day's activity? Oh Faith, it's stunning! Great work and the beads are lovely.